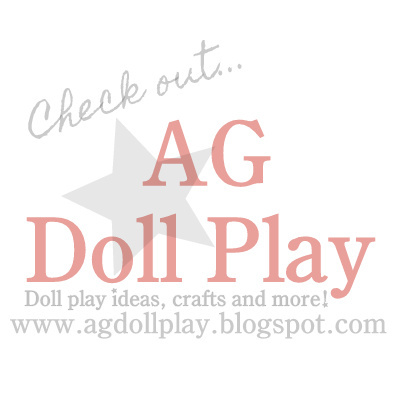 Today was a special day...we had our first ever doll holiday party! We had so much fun! Zoey invited some of her friends that are into dolls for some doll crafting, gift exchanging and good old fashioned fun. The invitations were tiny (for the dolls) and I tied them to a candy cane to give to each girl. It asked that they and their dolls come dressed in their finest holiday attire and to be ready for some holiday crafting fun. Upon arriving the girls first put their gifts that the dolls were exchanging, under the doll tree and then they each got to decorate a mini gingerbread house. I had pre-assembled the little houses the night before so that the were ready for decorating. We had the food out throughout the party so the girls could eat and snack as they wished. Our menu consisted of crackers, cheese and salami, cucumber sandwiches, veggie pizza, a beautiful veggie tray, fruit kabobs, mini cookies and pretzels, peppermint bark and cupcakes. Then of course was the opening of the doll gifts! Perhaps the most exciting part!! Here is Julie with all her loot...you can see here that she got two rubber duckies, a puzzle, a pillow with her name on it, a baking set and a handmade scarf. Here is Zoey showing the rolling doll suitcase that her doll Zoe got from Julie. After opening gifts it was time for some serious crafting. The girls made some frames out of popsicle sticks that they then decorated. They also made mini candy canes, mini jingle bells, and some handmade ornaments for their dolls but I didn't get a picture of those. Here is a shot of their finished frames. The girls had so much fun! It was just the thing to get them all thinking about Christmas and getting to share the excitement with their dolls was all the more fun. Here are some close-up shots of Zoey's thoughtful gifts that she received from her friends. This is the doll suitcase (made from a pencil box, stickers and buttons). On the inside of the suitcase was a pocket for her important things and she also got a handmade camera (made from duct tape and a bottle cap) and a passport which is so important when traveling abroad! Here is a close-up of the adorable camera! She also got a handmade lamp...I LOVE this! Genius idea! The base of the lamp is made out of clay and there is a little battery operated tea light on top of it and the shade is a plastic cup with ribbon mod podged around it. Adorable! She also got this sweet little baking set (just in time for all of that holiday baking) from one of her friends. You can see that the dolls are already making great use of it. What a special day this was! Afterwards, we all went into town to see Santa's Christmas Town where there were lots of trains and houses, etc. set up. I will try and share those photos in another post. 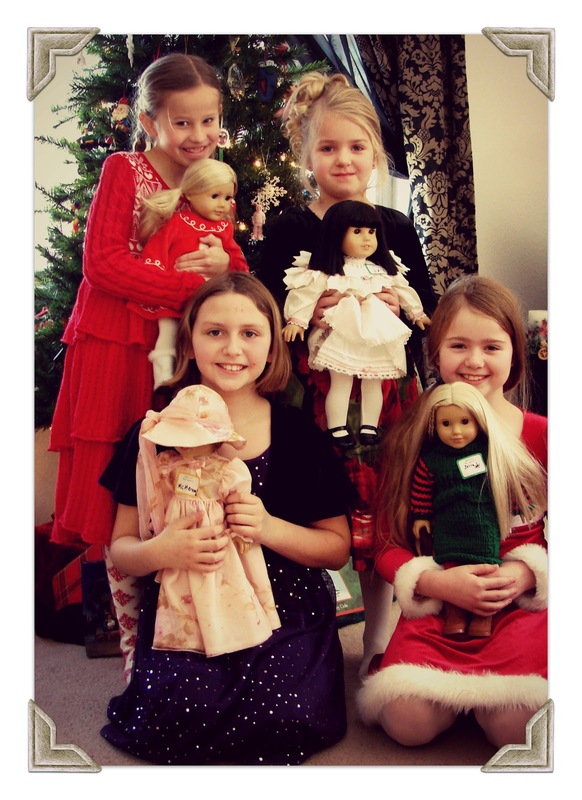 I hope that this little doll holiday gathering will be the first of many! This is just the sweetest party! I'm hosting one this year and wondered if you made homemade gingerbread and then created the houses for the girls to decorate? I'm trying to determine how best to tackle that idea! TYSM!